Published November 5, 2011 By Anna T. This post may contain affiliate links. Regardless, I only recommend sites I've researched and/or used and trust. 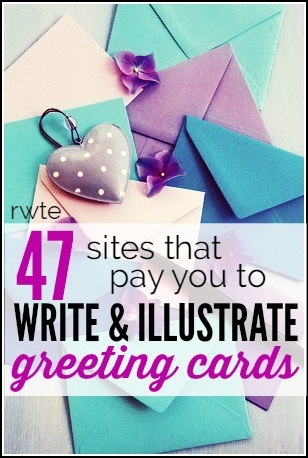 Have you ever wondered how you can get paid to write greeting cards? This sounds like very fun, interesting work to me because as we all know, greeting cards are very short and to the point. Usually you don't need to write more than three or four lines max. Almost all greeting card companies (with the exception of Hallmark who doesn't openly accept submissions) will consider work from freelancers. You may also be in luck if you're an artist or a photographer because many of these places will accept freelance submissions in those fields too! Is writing greeting cards as easy as it sounds? While it may seem easy, I keep reading that it's actually NOT easy at all — even if you're a very experienced writer. Most greeting card companies are very picky about what they will accept and even though what you write doesn't have to be long, it has to be catchy and engaging. Think about it — how long does it take you to decide whether or not you like a particular greeting card when you're browsing around in the store before you put it down and go find another? Probably not that long. So your writing has to be really, really good! It may also help if you can be funny since so many greeting cards are humorous. How much does writing greeting cards pay? Your pay for accepted greeting card submissions will vary depending on the company you're writing for. In most cases, the amount is anywhere from $25 up to $300 per approved submission. How selective are the greeting card companies? They are all pretty selective, and they have to be because they need to know their cards will sell. But the ones that are the most selective are the more well-known companies like American Greetings. For more tips and advice in getting started in the greeting card industry, I'd recommend giving this page from the Greeting Card Association a read. There is also an interview with greeting card writer Lynda Schab here at Creative-Writing-Now that has some tips and information on getting started for people new to greeting card writing. American Greetings – This company does accept freelance writing submissions, but they cannot be unsolicited. There is a formal process you must go through. Calypso Cards – Pays $50 if your idea is accepted. Specializes in humorous cards. Gallant Greetings – Not currently accepting verse submissions, but they promise to update the page when that changes. It Takes Two – It Takes Two does most of their verse writing in-house, but they are happy to consider your ideas if you feel you have something special and unique to offer. Oatmeal Studios – Another site that specializes in funny cards. They do not mention how much they pay writers. RSVP – Always looking for greeting card writers. Pay will vary. Smart Alex – They are always on the lookout for funny lines with a definite emphasis on humor for grown-ups. They pay $100 for accepted submissions. American Greetings – This company does accept freelance illustration and photography submissions, but they cannot be unsolicited. There is a formal process you must go through. Artists to Watch – You may submit your images or a link to your website for review. They respond to all submissions but only review them quarterly. BayView Press – They are looking for greeting card artists. Prefer clean, strong, uplifting painterly work. No illustrations. CardGnome – This is a site that allows you to upload your artwork to greeting cards and set up your own shop. Customers can personalize your card and you earn royalties off each card sold. Caspari Online – Just illustrations, no photography. Caspari does not accept submissions of photographic artwork as they do not reproduce photographic images in our products. Crown Point Graphics – Not much info is provided, but they do welcome art submissions for their cards. Galison/Mudpuppy – They accept artwork submissions via mail or email. Gina B. Designs – This company is in need of designs with excellent composition and use of color. Lots of details provided on their submissions page! Also check out their current “Art Call” page. Great Arrow – This company does accept freelance art submissions for their award-winning line of cards. You can download the guidelines for details. It Takes Two – It Takes Two is interested in art submissions that offer a fresh, unique design perspective that enhances their current product line. Submissions are not returned once submitted. Leanin' Tree – This company is happy to review art submissions for their cards. They prefer printed, mailed-in copies or email PDF files. Noble Works – Fill out a short form on their site if you are interested in receiving their artist guidelines. Palm Press – Palm Press needs unique photos for special occasions (birthday, Christmas, etc.) for their greeting cards. Paper Magic – Contact them via their feedback form for art and design guidelines. Planet Zoo – They welcome photos of wild animals in their natural habitat. They cannot respond to all submissions. Pomegranate – Read art submission guidelines for details. R.S.V.P. Sellers – Always looking for great talent, ideas, and concepts. No more than 20 images per submission. Recycled Paper Greetings – You can send up to 10 submissions at a time for consideration. The review process may take a few months. Smart Alex – They will consider illustrations and also original artwork. Most of their cards are humorous in nature. Payment is a one-time flat fee of $150. Up With Paper – To find out more about designing for Up With Paper, you may either contact them via email or mail in your portfolio. Want to write electronic greeting cards? There is money to be made here, too, although from what I've read you can't earn as much money with electronic greeting cards. Writing-World has an insightful interview here with Nadia Ali, an experienced greeting card writer who has done work for both the online and offline markets. 7 Mistakes Greeting Card Writers Make – What to avoid when submitting verse to publishers. How to Write Humorous Greeting Cards – Written by someone who has had success writing humorous greeting cards. Hopefully this list can help you get started! If you're lucky enough to get your work published in a greeting card, it would be awesome to add to your writing resume or artist/photography portfolio! Good luck if you decide to give it a go. What a BRILLIANT IDEA! This entry is SO helpful! thanks for all the great links! What about selling art or photos to a card company? Do you have info about that? Would these compañías accept Spanish verses with pictures from the Caribbean áreas. Lucy, You will need to click through to any of the links here for the company you’re interested in and follow the instructions there for submitting your work. Oh wow this is a great list! I have been thinking of attempting something for Blue Mountain. One day I just may get around to trying it! I know the pay is amazing! I did notice that the pay for Blue Mountain was especially good! Yeah, it sounds intriguing to me but I don’t think I can be witty enough in just a few short sentences. Still though, I know there are some people who are really good at that. This is a very nice idea… especially holiday season is coming already. This will be a nice way to develop your creativity and at the same time earn extra money to spend this season. Thank you for the idea and more power. You’re welcome! I think it’s good money if you’re lucky enough to get your submission selected. And great for your writing portfolio!